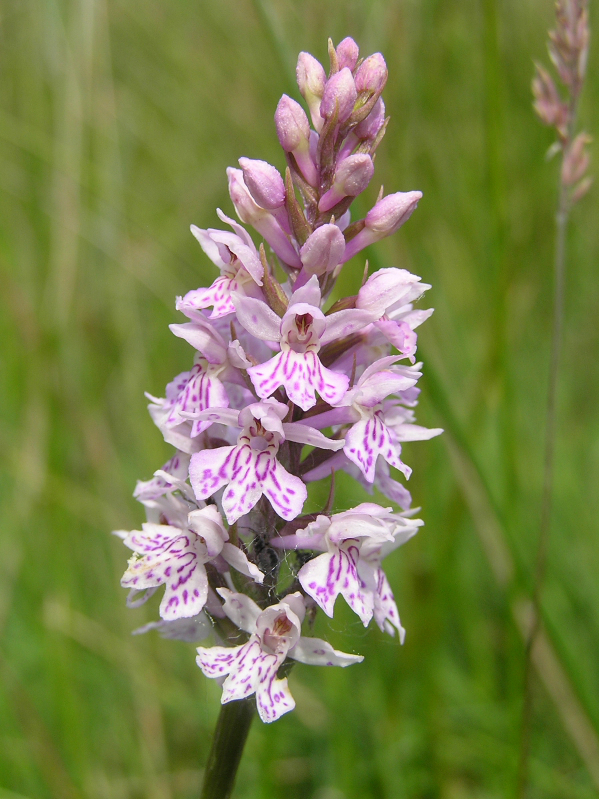 The Common Spotted Orchid is one of the commonest orchids in Great Britain, part of this is because it will grow in a variety of habitats from fairly shady woodland through to open meadows and roadside verges. In colour it can vary quite a lot from almost white through to pink and even some decidedly purple specimens. The flowers have darker spots and lines on them, these are honey guides. The two main characteristics to aid with identification are the shape of the lip petal which is distinctly pointed. Also the leaves are marked with dark purple spots or bars. This latter characteristic is also shared with the Early Purple Orchid and some Marsh orchid species.. The photo to the right is of a specimen growing in a quite shady position in the Forest of Dean but close to the Wye valley. 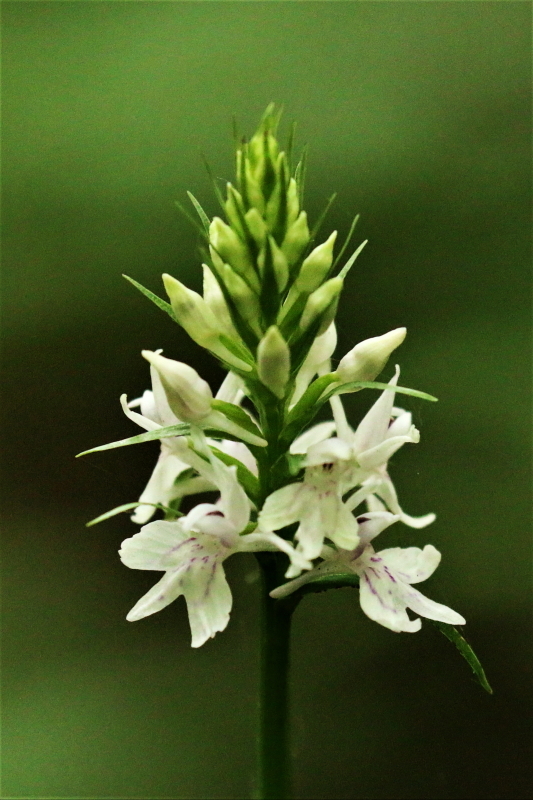 Orchids which could be confused with the Common Spotted Orchid are the Heath Spotted Orchid, but this has a much more rounded lip petal and the central pointed part is quite small and does not extend in a prominent way like the Common Spotted Orchid. The other possibility for confusion are the various types of Marsh Orchid but these do not generally have distinctly spotted leaves and the lip petal of the flower is just rounded, it does not have a central pointed area. As I have said these orchids, unlike many other species seem to have maintained their populations in recent times. There is a small meadow near to Cleddon bog in Monmouthshire where last year (2016) there must have been several hundred flowering. This year there are about 30, however this is often the case with orchids. 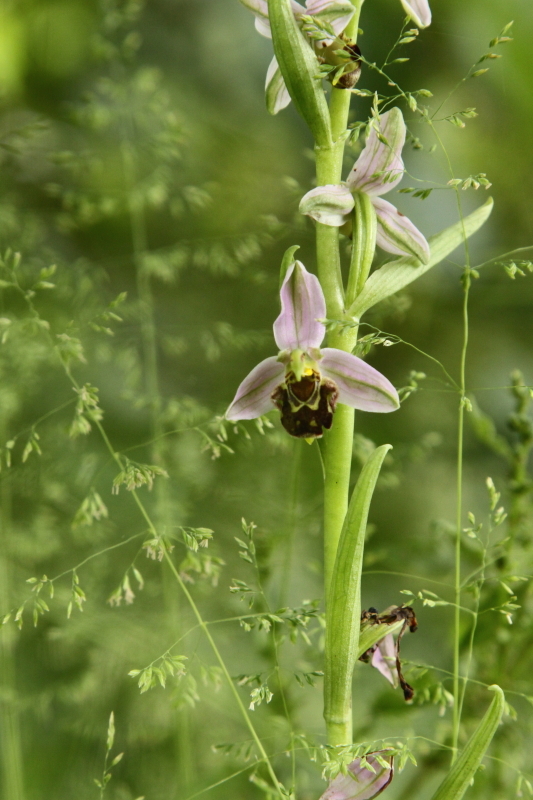 I remember an occasion when I took a group of students to a place called Foulden Common in Norfolk, which was good for various species of orchids and I saw a Bee orchid. I then proceeded to give the students a 5 minute chat about orchids, their over specialisation especially with regards to pollination and their rarity. To which one student said ‘They are not rare, look there are 5 over there and another patch there and more over that way etc etc’ He was right and that one year there must have been a couple of hundred Bee orchids growing on the common. But in 30 years of going there that was the only time I saw that many, most years it was single figures at best. I digress. Back to the Common Spotted Orchid, they flower in late May through June, They are fairly tall, especially if competing with grasses in a meadow, they will reach 50 cm or even 70cm at a push. Flowering when they do means that you should not muddle them up with the Early Purple Orchid as by the end of May they will have already flowered and the seed pods will be quite advanced in their development. To check out other wildflowers found in the woods of the Wye valley and Ninewells wood click Woodland Wildflowers of the Wye valley and Monmouthshire.